Description: The Leaf Storm is a high-end collaboration folder designed by Kevin Wilkins. 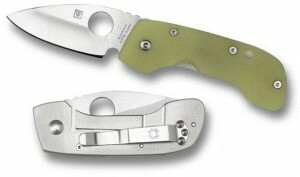 It mates a CPM-S30V blade with Translucent G-10 scales and Titanium framelock. One of my personal favourites from Spyderco in a long time. There exists a pilot run of 50 peices marked “Pilot-50pcs”. This entry was posted on Thursday, January 7th, 2010 at 1:07 am	and is filed under 2" to 3" Knives, Designer - Kevin Wilkins, Features - Screw Construction, Handles - G10, Lock - Frame Lock, Manufactured - USA, Steel - CPM-S30V, Type - Folding Knife. You can follow any responses to this entry through the RSS 2.0 feed. You can leave a response, or trackback from your own site.